The dreaded blank screen stares back at you. Your to-do list is growing. You’re bleary-eyed. All you want to do is to kick up your feet at the end of a long day and enjoy your favorite beverage. It’s up to you, however, to turn the stubborn empty page into a tasty blog post that your audience devours. And that leaves you struggling to shoehorn the creation of a blog post into the days when you don’t have a minute to spare. You try to avoid it. Perhaps you could get away with creating fewer blog posts. But who are you kidding? You’ve seen the stats. Like it or not, the more you blog, the more visitors your website will attract, and your website is the center of your online marketing universe. The truth is, blog posts feed your inbound marketing program’s success. You can’t afford to have it fall flat on its face because it’s starved of content. After all, your reputation is on the line. So how do you go lickety-split from that blank screen to words that tempt and satisfy? You have to change how you write. In this blog, I’ll give you 7 easy ways to beat writer’s block and become a content creation machine. I know. You didn’t want to hear that you had to do your homework. Can’t you just say the dog ate it and move on? Perhaps. But you’ll pay the price. If you do the upfront work to set the foundation, everything else will fall into place more easily. Start with your persona research. Understand your buyers and the questions they ask throughout the buying cycle, then fill your editorial calendar with topics they want to learn about. That way you’ll always have ideas up your sleeve. You won’t be wracking your brain each time you write or second-guessing whether your audience is interested in the subject matter. Now that you know what you’re writing about, it’s time for a little pilfering. Yes, I agree. Stealing is not ethical. Also, your blog post needs to be original to climb the search engines and to turn people’s heads. So where does stealing come in? Headlines can make or break your post. Remember, attention spans are shrinking. You have eight seconds or less to capture someone’s attention. Where’s the proof for that 8-second mantra? 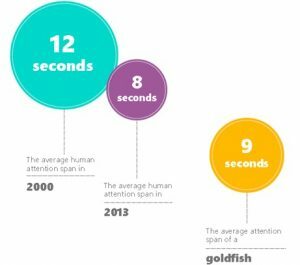 Well, Microsoft did some digging into the question “How is technology impacting attention spans?” They discovered the average human’s attention span had shrunk from 12 seconds in 2000 to 8 seconds in 2013. (Apparently, that’s less than the attention span of the average goldfish. But I’m not sure how they measured that one.) Who knows what the attention span has shriveled to by now? The point is, you have to grab attention immediately. Fortunately, there’s a time-saving way to do that—use tried and proven headline formulas. Yes, just like math there are formulas for writing too. Just fill in the blanks and work your magic. 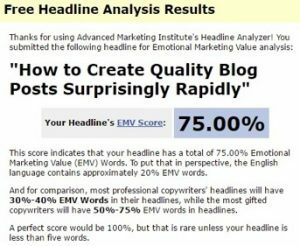 Finally, to make sure you’ve put the right words into the blanks, plug your headline into this handy headline analyzer, courtesy of the Advanced Marketing Institute. It measures the emotional content of your headline. Since emotion moves people, it can tell you when you have a winner. Play with it to increase your score. It’s fun. To write quickly, you need an outline. It’s the bare bones that give you confidence that you’re headed in the right direction. It should include the key points you want to make and, of course, your introduction and conclusion. Be prepared to break it. As you write, you’ll continue to research and new juicy thoughts will float into your brain. When they do, reevaluate. Maybe there’s a new fascinating twist your article can take. Use your judgment, but allow your blog to take on a life of its own. Perhaps you’ll even surprise yourself with your conclusion. So, don’t let your outline stifle your creativity, but do let it create momentum that moves you forward effortlessly. It seems paradoxical that you can write a blog post without writing. With today’s technology, however, you can do just that! All you have to do is speak to a voice recognition app. These apps can transcribe up to around 160 words a minute. But it’s not just the speed at which they put words on a page that makes them powerful. It’s the speed at which you can release those words from your brain. If you’re typing, you have to focus on the words that spring from your fingers until they’re firmly planted on the page. On the other hand, if you’re speaking, you can release them from your mind as soon as you’ve said them. The app continues to transcribe them as you proceed to the next thought. Voice recognition software frees up critical brain space. There’s another situation where speaking works well—that’s with those subject matter experts who too often refuse to write articles. But you know what? They love to chat about what they know best. Interview them. They’ll be flattered. They know their stuff well, so you don’t want to slow your interviewees down. Record what they say and get a service to transcribe it. Afterward, you can take the transcript and shape it into something valuable. 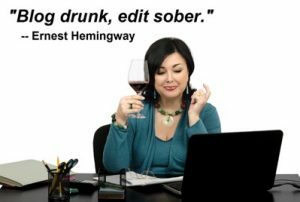 Ernest Hemingway once said, “Write drunk, edit sober.” Now, given his love of martinis and mojitos, Hemingway just might have been serious. However, don’t take me literally on this one. I just want to emphasize that the first time you write something, treat it as a big ugly draft, a.k.a. a brain dump. Let go of your inhibitions. Don’t judge as you write. Judgments are just speed bumps in your writing process. You can edit your thoughts once you have them on the page. Then edit it again and again. It’s like putting the finishing touches on a sculpture. You’ve heard the advice. Shut down your email alerts. Turn off your phone. Close the door to your office. Set a timer. Get it done. Nope. That’s not the best approach. You’re not reading a legal document or crunching numbers. You can’t power your way through it. You’re creating something out of nothing. According to an article in Scientific American, “Insight problems involve thinking outside the box. This is where susceptibility to ‘distraction’ can be of benefit.” They conclude that when you’re less focused, you may consider a broader array of information and gain more insight. Play some music. Let the cat sit on your lap. Take a break to gossip with your officemate. Here’s the really good news. You don’t even have to sit (or stand) at your desk to get your blog done. You can do it in chunks, allowing for distraction breaks. 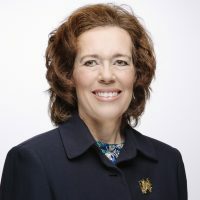 Alice Flaherty, a neuroscientist, says dopamine in the brain is the key ingredient for creativity. The more, the better. So how do you get more of it? Do something that helps you to relax. Start your blog, then leave it. Go for a run. Sleep on it. Break for lunch. After all, your brain needs to mull it over—not in the forefront, but in the background. So why strain yourself when you can let your unconscious mind do the heavy lifting? Writing a blog in pieces may take more time from start to finish, but overall, you’ll spend less time in front of that screen. One way to rid yourself of blog writing is to hire it out. That way you can conquer the other items on your to-do list. You could, for instance, enlist the services of a freelance writer or marketing agency. You’ll find they have expertise in writing blogs and offer rapid turnaround. If you’re not ready for the works, there’s one thing you absolutely should move off your desk—proofreading. Even the best writers use proofreaders. Here’s why: most people’s brains are wired to screen out the details and see the big picture. The ability to generalize allows us to take in a lot of information at once without becoming overwhelmed. The problem, however, is that proofing is all about the details. Also, as Nick Stockton, a science journalist for WIRED Magazine explains, our brains create maps of familiar places, enabling them to consider other things. That’s why you forget the details on your daily commute. Even without them, your car practically drives itself to its destination. The same is true for proofreading. When you proofread your article, you already know where it’s going. If a word is missing, your brain fills it in. Result? It’ll take you forever to proof your own work, and because your mind plays tricks on you, you’ll likely mess it up. Clearly, looking at a blank screen and hoping for it to turn into a blog article is no fun. If you make a few changes to how you approach blogging, you’ll no longer dread it. Just pluck one, two, or all of these tools from your writing toolbox, and you’ll feel empowered to conquer your editorial calendar. After, you can bask in the satisfaction of watching your web traffic and engagement skyrocket. End the workday on time and go home feeling successful, satisfied, and relaxed. How do you beat blogger’s block? What methods have you incorporated from my tips above in your writing practice? Tell me about it in the comments!